Not spoilery, but if you want to be TOTALLY surprised, then maybe read this after you watch it. I haven't read A Wrinkle in Time in a VERY long while (save for the first handful of chapters, which I read a few weeks ago in preparation for the movie, but then I got sidetracked and didn't continue), but this book will always have a place in my heart because I remember being assigned to read the first chapter in sixth grade English over a weekend, and I ended up reading the ENTIRE thing that Friday night. It was the first school book I had ever read that didn't feel like a school book, and I loved it so much. So when I originally heard there was going to be a movie, I flipped. And THEN when I heard that Meg would be biracial, I freaked the F out. The book was first published in 1962, and while there was a lot that was forward-thinking about the book, I loved that the filmmakers decided to push the story forward even more. So, with all that in mind, yes, I felt like there were some corny moments or jokes, but that's because I'm an adult watching a movie made for kids right now, not a movie made for adults who read the book as kids. And yes, I felt like the pacing and exposition could've been better (especially since I recently reread the beginning of the book), but movie adaptations of books usually have a lot of material to squeeze into a short time anyway, so the point got across, even if it was done quickly. But otherwise? I really loved this!!! And I thought it was made even better by Meg being biracial because it added a whole new dimension to the ridicule and lack of sympathy she was facing as the story begins. The fact that no teachers (regardless of their race) seem to recognize the pain she's feeling, the fact that she gets branded a delinquent even though she's genius-levels of intelligent feels so much more... IDK... impactful? given that she is a black girl. And I love that the writers and filmmakers didn't just ignore her race either, as if Meg could've been played by anyone of any race and they just happened to cast a black actress--her character is black. There are a couple points in the movie where Calvin (boy who is her friend and likes her, and who is white, btw) mentions that he really likes her hair as it is (natural), and initially she's just like, NOPE. It's no coincidence that the mean girls at school all have silky straight hair. And at a later point in the movie, when the villain shows her a "better" version of herself, that version has straightened hair. But Meg's magic is that much more magical too. Maybe I'm reading too much into this, but one of the moments that really made me cry was when Meg and Mrs. Which (Oprah) were having a conversation where Meg basically says she wishes she could come back from their journey as someone else, and Mrs. Which tells her (paraphrased by me), "But there were so many choices and moments that had to have happened since the birth of the universe for you to exist right here in this moment, as you are." It was such a beautiful sentiment, and I'm just imagining how significant that exchange is, between the two characters as well as between the two actresses. Imagine being Storm Reid and shooting this scene where OPRAH is telling you that you are awesome just as you are. <3 And in fact, there are so many moments where other characters tell Meg how beautiful she is and how special she is, and I cried through all of them. In the scene where Zach Galifianakis (I had to look up the spelling), playing The Happy Medium, tells her that she is precious, he looked like he had tears in his eyes, and you know what? So did I. Basically what I'm trying to say is that there is #blackgirlmagic all over this movie, and I AM HERE FOR IT. 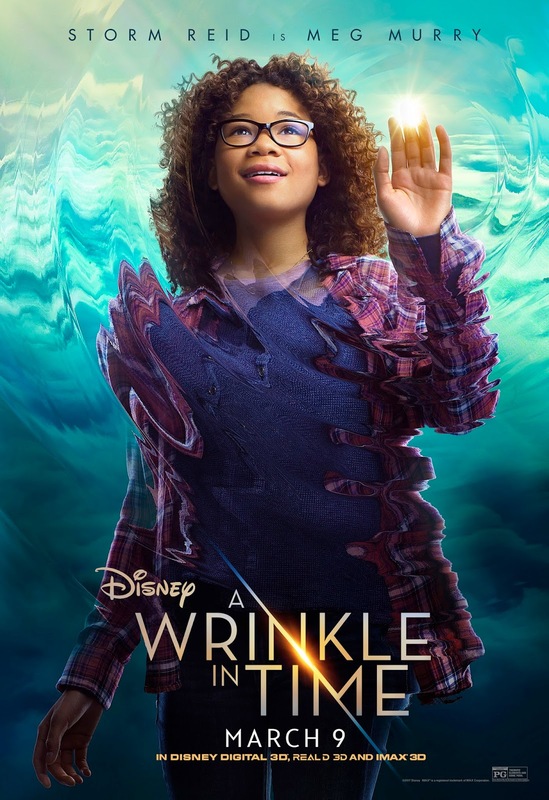 The overriding message of the movie, for anyone of any race, is that each of us has the capacity for good and love (and that we all of us deserve goodness and love), but it was beautiful to see a black girl at the heart of it in this movie. And Storm Reid really was SO good. I know the movie marketing materials all have the Mrses (how the heck do you pluralize that? Misses?) splashed all over the place because Oprah, Reese Witherspoon, and Mindy Kaling are a Big Deal (and Mattel even made Barbies of them), but COME ON. This is Meg's story. This is Meg's journey. And maybe no one knows who Storm Reid is yet, but now they will. Also, by the way, Gugu Mbatha-Raw, who plays Mrs. Murry, is like, the most stunning kid-movie mom of all kid-movie moms, possibly ever. And I love how the Murrys marriage was depicted--well, not just their marriage, but their professional partnership too. It was something I've always appreciated about their characters in the book, and I love that it was well-preserved in the movie. So yes, I loved it. If you haven't seen it yet, I would say, be prepared for things not to be just like the book. It is definitely an adaptation. But all the important parts are there: the science, the magic, the love, and the power of one Meg Murry. Now I REALLY need to go reread the books.